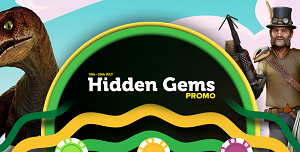 Ladies and gentlemen, get ready for our latest exciting promo… Hidden Gems is the name in Casino Luck, and free bonuses and spins is the game! Our thrilling promo will take three days, i.e. July 18th, 19th and 20th 2017. Get yourself ready for the three-day sales marathon; we will be escaping some dinos, saddling up for a great western outing escapade and, in the process, receiving lots and lots of free spins, discounts and bonuses! Get your shovel, roll up your sleeves and prepare for some treasure-hunting. If you deposit a minimum of 38 pounds/ 50 dollars by Tuesday, July 18th, you qualify to instantly receive up to 100 free spins in the steam, punk-inspired slot, Steam Tower. An escape from the raptors/ fierce-looking T-Rex is guaranteed, plus a fabulous 7.5 pounds/ 10 dollars bonus, if you wager a minimum of 38 pounds/ 50 dollars in the Jurassic Park on Wednesday, July 19th. Get ready for the Wild Wild West and deposit at least 15 pounds/ 20 dollars on Thursday, July 20th and you get an instant 40 free spins in the western-themed slot, Reel Bandits.